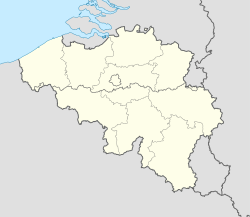 Aubechies is a village in Wallonia, Belgium. It is part of the municipality of Belœil. Aubechies is a member of the Les Plus Beaux Villages de Wallonie ("The Most Beautiful Villages of Wallonia") association. The Archeosite and Museum of Aubechies is located in Aubechies. A museum dedicated to the period of history from pre-history until Roman times, it is the largest archaeological open-air museum in Belgium. The village has a Romanesque village church dedicated to Saint Géry, a town hall and a school. It is a typical example of Wallonian villages in this area. ^ a b "Aubechies". Les Plus Beaux Villages de Wallonie. Retrieved 18 July 2015. ^ "Archeosite and Museum of Aubechies". Office du Tourisme Tournai. Retrieved 18 July 2015.